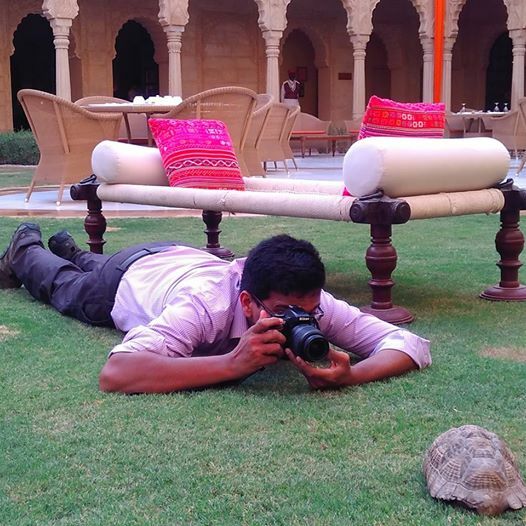 Did you know that Suryagarh Boutique hotel in Jaisalmer is completely pet friendly? 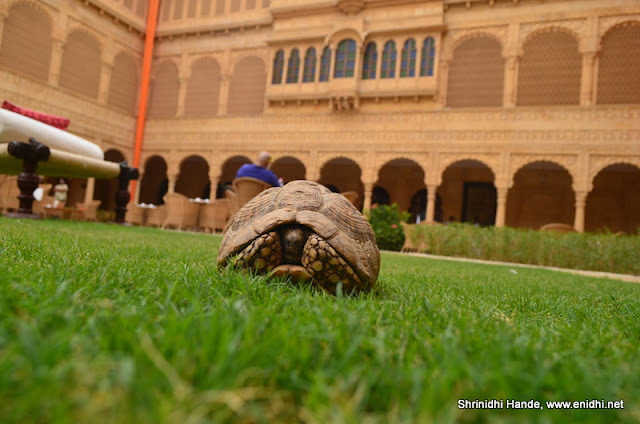 If you have a pet animal and wish to take it with you while on holiday, Suryagarh is completely prepared to welcome and take care of your pets.Suryagarh campus houses several different animals and pets- Cat Juju, Badal the Horse, Two male peacocks, lots of pigeons, Emu, two golden retrievers, and Thakur the pet turtle. 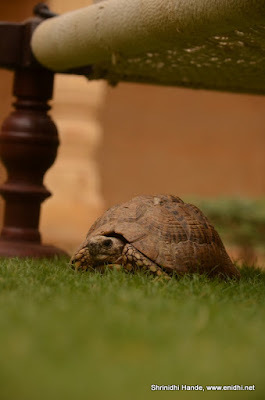 Staff at Suryagarh are very accommodating of animals and take good care of them. They know what to feed and other animal basics and can take good care of your pets. 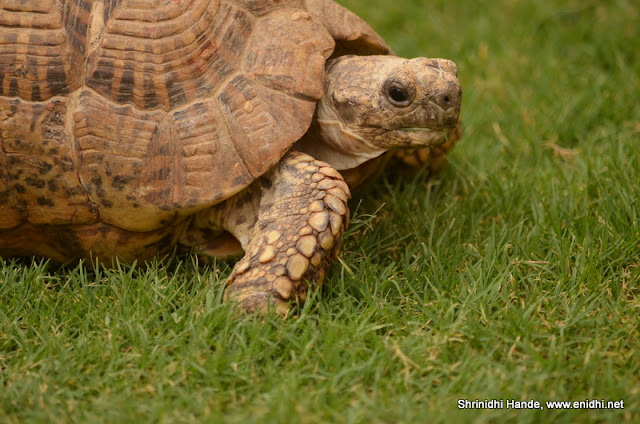 This post is dedicated to the slowest of all pets in Suryagarh- slowest but probably hardest- Thakur the turtle. This little fellow is housed indoors during most of the day and is allowed to move around the lawn between 7 AM to 10 AM, during which he slowly crawls around, munches on the grass and gets his daily dose of walking. I spent good amount of time photographing Thakur the turtle this time. 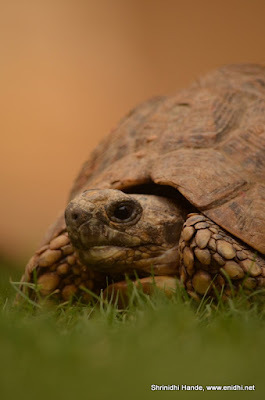 Because turtles move slowly, it is easier to compose your shot. Take a look at some of the photos below. Capturing above pictures were perfect exercise to experiment with depth of field concept. Clicked with 55-300mm lens, with adequate zoom on the subject, in A mode with right combination of F and A values. Green grass and orange-ish background helped a bit. Got good number of likes when I posted this on facebook. I solicit comments from photography experts if there was anything else I could have done better in this scenario. 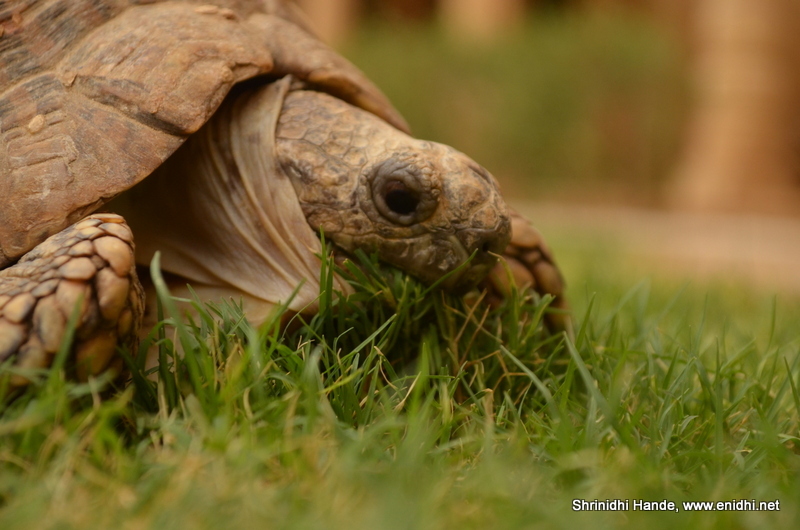 Below- Thakur the pet tortoise eating grass. Notice the pouch like layer around his neck. 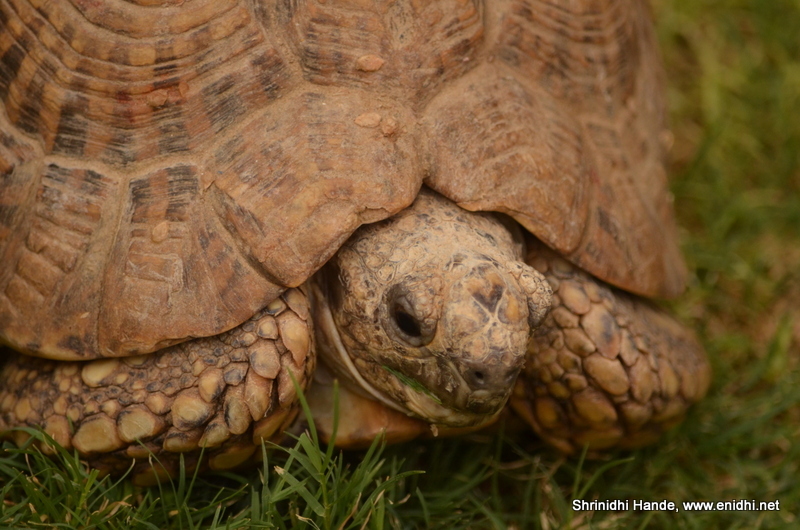 Looks like Thakur was not afraid of the camera lens. He didn't retract his neck when only lens was in front of him and I was behind the lens. But when my face was in his direct line of vision, he would hesitate and if I move, retract into the comfort and safety of his shell. Below was my position while trying to click above pictures (clicked by Mridula)- this pose was actually staged next day while above pictures were clicked a day before. When you visit Suryagarh, do say hi to Thakur. 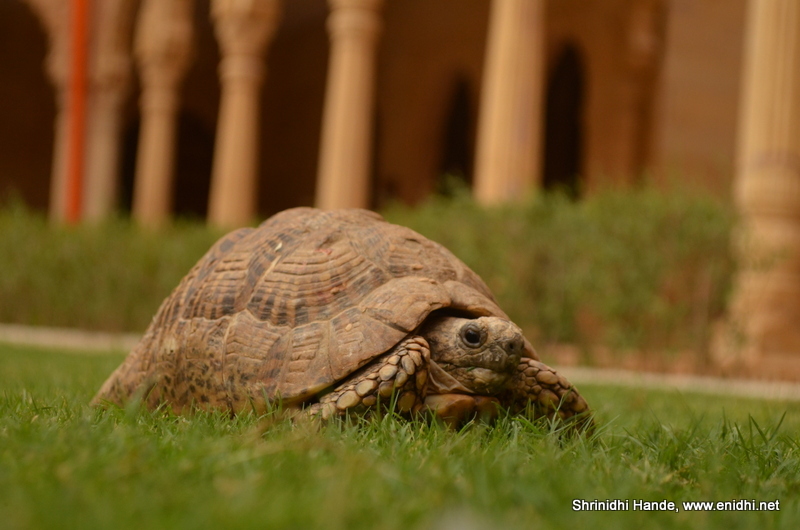 Of all the hotels I visited, Suryagarh remains special because of these animals in their campus. Hope you won't mind if I write another post on rest of the animals in Suryagarh campus. 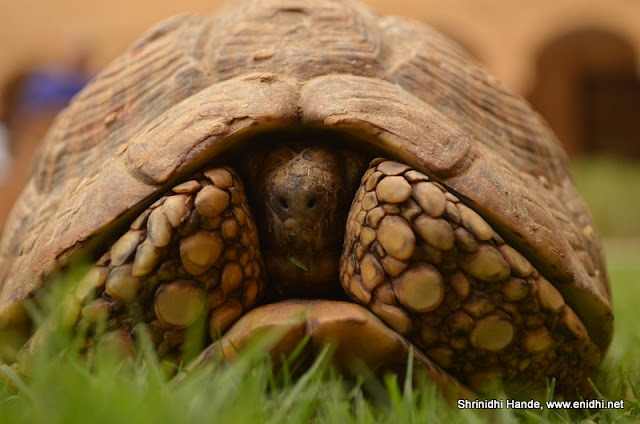 I am sure Thakur is wondering " Kitne Photograph Loge "
:) or "ek do acche wala email kar dena, profile pic kar doonga"
Looks like a Star Tortoise. Its actually illegal to have one as a pet. Their numbers are on the decline, and without protection we may lose these beautiful creatures. Assuming Suryagarh has necessary permissions.